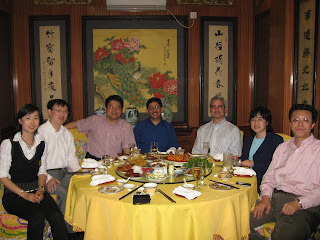 I had an opportunity to sample a variety of food during this trip. My host took me out for lunch at a restaurant that specialized in Duck. For those who haven’t tasted the famous Peking Duck, this dish is mostly prized for the crispy thin skin of the duck which is glazed with a layer of syrup before cooking. 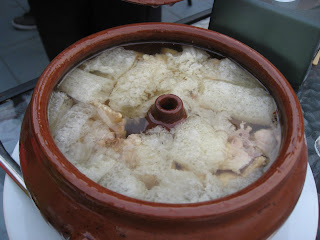 The skin, the meat and the soup made from the bones and remaining meat form a complete meal. For large groups, the chefs usually carve the duck at the table - like they did at ours during a team lunch. 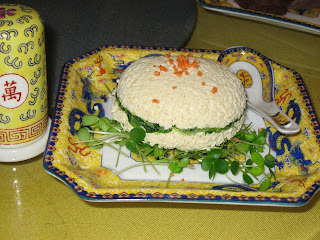 The eating protocol consists of smearing hoisin or noodle-sauce on the thin pancakes that accompany this dish. 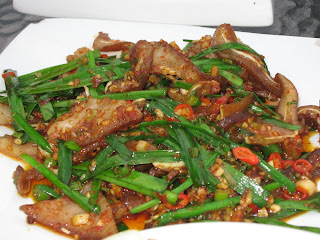 You then place thin strips of cucumber and spring onions, sugar/ginger, and the meat. The pancake is then wrapped into a roll and eaten. The slivers of skin and fat melt in the mouth. My hosts were extremely hospitable. They had taken it upon themselves to make sure I was attended to every minute of my stay. This reminded me of the times when my (India) team was much smaller and we would do the same for every visitor who visited us from overseas. Near Tienanmen Square, a heritage Train Station is being restored to it's former glory, as is a street nearby which is being re-modelled to look like it was hundreds of years back. Toy-vendors on the subway were selling toys and memorabilia with the five mascots of the coming Olympics. During my last time in this city, I had spent all my spare time visiting the many historical monuments. This time I let my hosts take me to dining spots with a lot of local flavor. 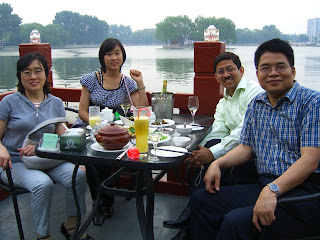 On one day, we got ourselves a table outdoors at a lake-side restaurant on Houhai Lake. This street is lined with restaurants along the lake, each one prettier than the other with intricate paper and wood lanterns, gold-red-green patterned design adorning furniture, etc. As we sipped on our drinks and enjoyed the cool breeze, I perused the menu. Aha! I finally find the really ‘exotic’ stuff on my menu. 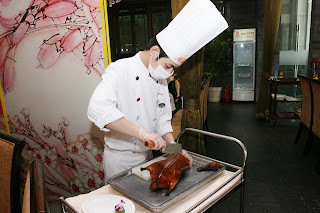 J Does Fried Bamboo-shoot Worms, barbecued duck tongue, and fritters of chicken soft bones sound exotic enough to you? A colleague who was out with friends the last night even found dog meat – and said it tasted like pork. Sorry to disappoint you, but I didn’t order any of the above! 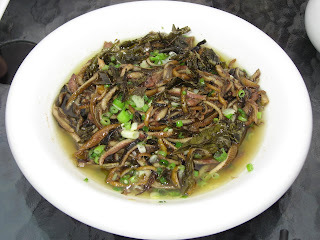 Instead, I let my hosts take me on a culinary journey of Chinese small plates that included shredded eel, shredded mushroom with dry red pepper, pork with hot chillies, greens in garlic sauce, chicken soup (with skin and bones included, but rather tasty!). 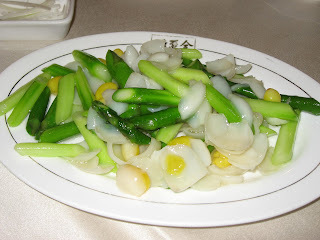 Another day, my lunch included Fried Gingko with Lily & Fresh Asparagus. Gingko is a very unusual tasting vegetable and is known to have (ahem) aphrodisiac qualities. 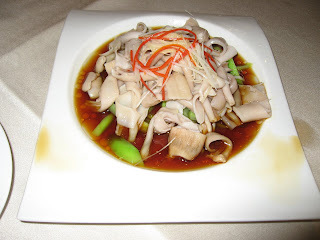 Another dish on my table was the scalded geoduck Clam. The scalding is supposed to perfectly preserve the taste of the clam, which did taste very good. 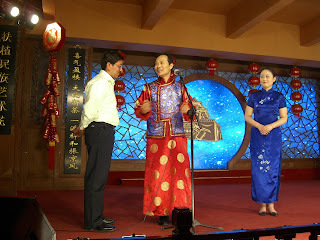 On one evening, my gracious hosts took me to the Laoshe Tea House for a night-time show. The Tea House is richly decorated with costumed ushers. Tables are laid out in a large hall with a stage in the front. We had seats in the front row. 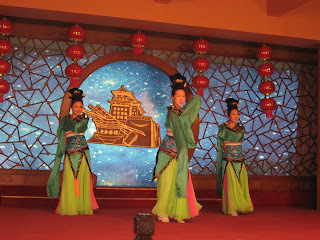 Over cups of hot green tea, dried berries, nuts and local desserts, the show unfolded in front of us. 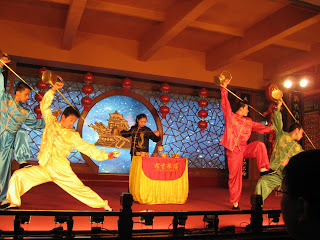 First came the musicians, followed by dancers, singers, mimics and acrobats. 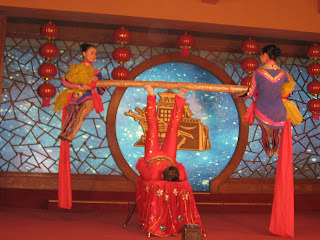 Chinese acrobats are among the best in the world and the show here was spell-binding too. Then came the turn of the Magician, who went through his repertoire of the usual stuff. Usual that is, other than the fact that I was in one of his items (see picture above!). 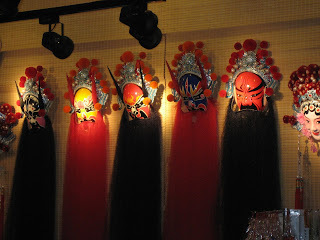 But the highlight of the show was clearly the Masked Girl with a dozen faces (from Sichuan?). Apparently, the trick is a family-guarded secret handed down generations. A girl with a painted face-mask dances to music and from time-to-time, her mask magically changes to a different one. She initially always turned around, and by the time she turned back towards us her mask would be changed. But towards the end, she would snap her fingers while right in front of our faces (at our tables!) and the mask would change to another one. It had to be seen to be believed! 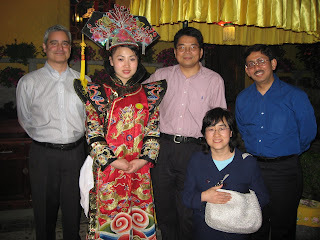 On the final night, I was taken to an Imperial property that has been converted into a Imperial dining experience. I was royalty for one night! Escorted by brightly costumed hostesses, we got to our dining room through winding paths in a garden. The room itself was decorated with scrolls, paintings and pottery - the only reminder that we hadn't gone back in time was the sight wireless headsets discreetly attached to the ear of the hostess. 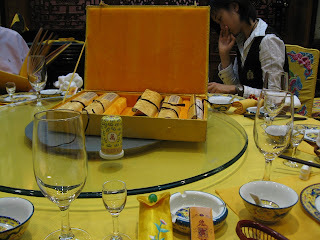 The menu was printed on silk scrolls that came in a velvet box. There was much to each. I remember Deer, Fresh Fish, Chicken – beak, head, and all, Pork, Squid, and many many more. After dinner, we strolled around the splendidly adorned garden that seemed to be from another age, with elaborately costumed waitresses, intricate lanterns and ancient paintings all over the place. Water gurgled from a stream as the path wound through different low-lying buildings that housed eating rooms that were richly appointed and curtained off with beaded curtains. When Indians think of Chinese food, we always think of noodles and fried rice. 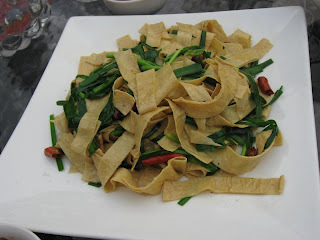 This time in Beijing, I don’t remember having noodles at all in any of these elaborate dining experiences. Actually neither did we have too much rice. The duck was wrapped in thin pancakes; otherwise food mostly consisted of meats and greens! Hospitality extends to the dining table. My local hosts would quickly fill my glass with wine without waiting for the waitress to do so. My friends here told me about how they selected English first names to make it easy for outsiders. Some chose their names when they took up jobs with the American companies, while others were given their names by their teachers at school. 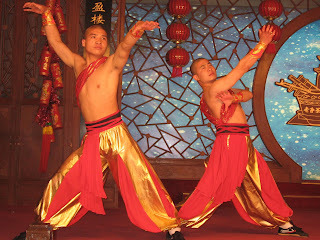 Their Chinese names continue to be their legal names and the ones they use at home. Sort of like the BPO guys and gals in India who turn into Mary, Sam and Angela during nights. I had to wake up at an unearthly time again so I could be at the Beijing airport by 5 AM for my return flight. Again, I noticed what seems to be a standard ritual here at the airport. Before the staff begins their work, they gather together and line up to listen to their leader reading out something! Not sure what. 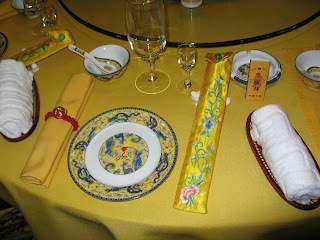 Update, July 2008: Some of you have asked me about the Imperial dining experience I mentioned above. The name of this place is Baijia Dayuan, No. 15 Suzhou Street, Haidian District, Beijing. Phone: 62654186. 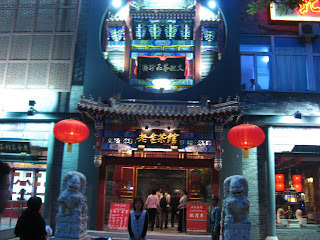 Other details: This restaurant was once the residence of Prince Li of the Qing dynasty. 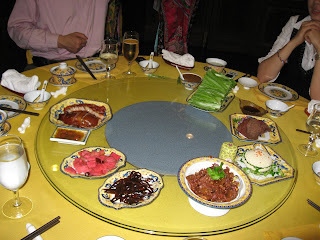 The restaurant serves imperial court cuisine and unique Baifu dishes. 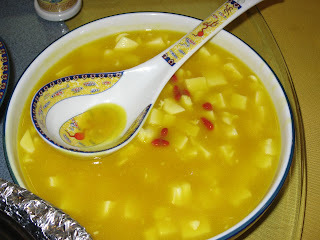 What a brilliant post about Chinese food - my mouth is watering. Peking Dock is one of my fave and fortunately we have some Chinese restaurant in Oslo, Norway too. Your royalty evening sounds perfect and of course the china looks beautiful! Btw: Great to see you in some of the pics too - thanks for sharing! @renny: One of my rare long posts! With such a variety in food I had a difficult figuring out what not to leave out of this post. The magic show you described was quite intriguing. Its hard to believe that the mask could change at the snap of a finger, but then like you said, one has to see it to believe it! I don't write on google blogger anymore. I couldn't change the CSS (AFAIK). I host a blog on the home server now (https://swmi.dnsdojo.org/wordpress). Ah, a bit of disappointment because you did not order the exotic food (worms, tongue, soft bones and dog meat)..haha! 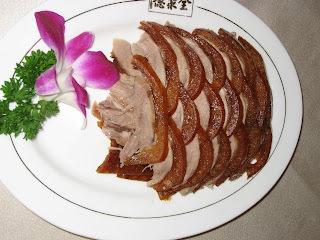 Now that you name it, the Peking Duck is one of the little Chinese traditions left unaltered. You see, the city changed its name to Beijing due to phonetic. 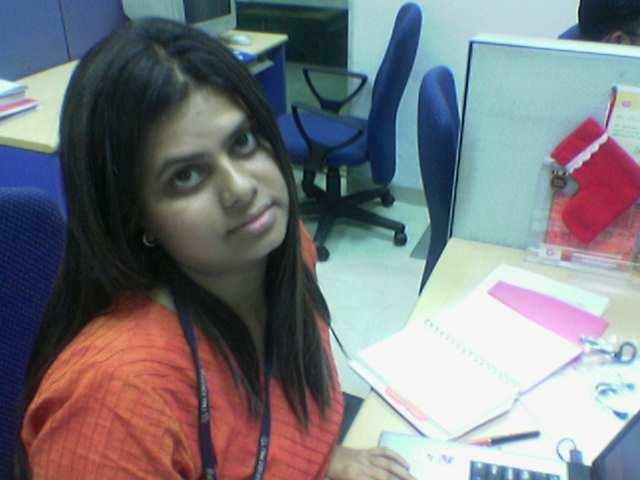 @shuchika, harekrishnaji: Good to see you here after quite a while! @shaan: Thanks for the detailed information. I will definitely keep this in mind when I am in Hong Kong!